The ZTE Blade S6 Plus brings a 5.5 inch display, LTE, 64-bit hardware, a great camera, and Android 5.0 lollipop in a budget-friendly large-screen package. The standard of “budget-friendly” smartphones is constantly rising and today’s more affordable mid-range devices are easily equivalent to, if not better than, flagship devices of only a couple of years ago. The competition in this space is heating up, and there a lots of devices to choose from, some are sub $300, and the pricing goes as low as $200. 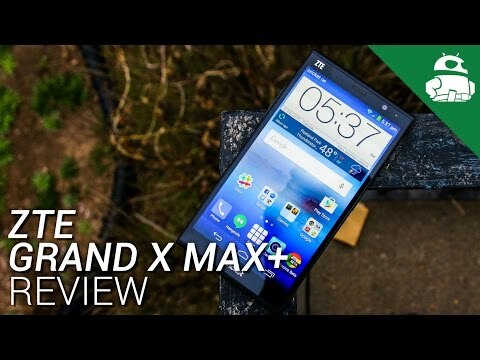 One company that has been making waves in this space is ZTE. 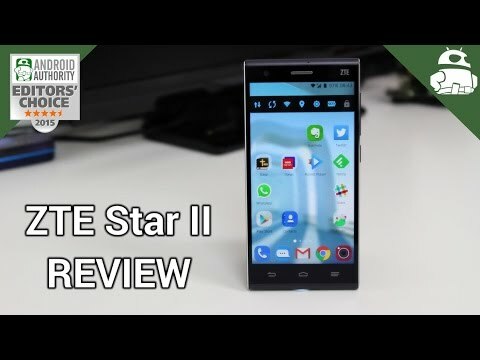 I just recently reviewed the ZTE Star 2, a sub $400 smartphone with all the qualities of a flagship device. 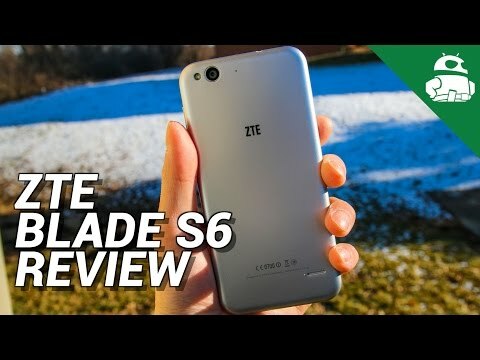 Lanh reviewed the $250 ZTE Blade S6 in February, and now ZTE has launched a bigger version of the same device, the ZTE Blade S6 Plus. With a 5.5 inch display and the same basic internals as the Blade S6, the S6 Plus has lots to offer. So let’s take an in-depth look at the ZTE Blade S6 Plus. Like the ZTE Blade S6, it is quite obvious what has inspired the design of the S6 Plus. From its gray colored body, rounded corners, circular home button and even the naming convention, the Blade S6 Plus borrows heavily from the design language of the iPhone 6 Plus. Of course, while it looks similar, the actual feel in the hand is a completely different story. The entire body of the Blade S6 Plus is made of plastic, and while plastic doesn’t necessarily have to feel cheap, unfortunately it could be said of the Blade S6 Plus that it lacks a premium feel. For example, the plastic is coated in a smooth satin finish, likely to mimic the metallic feel of the iPhone 6, and it tends to slip around in the hand quite a lot. Although I didn’t drop the phone during the few days that I used it as my daily driver, I can see that it could be a worry for some. Although overall the Blade S6 Plus looks like the Blade S6, there is one big difference in its construction. The Blade S6 is a sealed unit that uses trays for both the SIM cards and for the micro SD card. However the S6 Plus is different. The back is removable and the cards are inserted in a more traditional fashion. However the battery still remains non-removable. Lanh’s Blade S6 had a issue with too much movement in the back cover and as a result a general hollow feel to it. But because of its different cover construction, I didn’t see anything like that with the S6 Plus. Since the ZTE Blade S6 Plus has a 5.5-inch display it is quite a big device. This isn’t help much by the large space at the bottom for the capacitive keys. Although we are only talking about a couple of millimeters, it just seems over-sized to me. But on the plus side, the device is fairly thin at under 8mm, which when combined with the rounded corners and rounded sides, means that the phone easy to hold. However one-handed use, for me at least, is out of the question. Going around the device, the power button and volume rocker are located on the right side, and can be easily reached. The headphone jack is on the top, along with the IR blaster. While on the bottom is the micro USB port. The Blade S6 Plus utilizes capacitive keys up front, and they do have an appealing unique look to them. The home button in the center is denoted by a blue ring that also glows a nice bright blue when you touch it, when you have notifications, or when the device is charging. Two LEDs flank the home button to represent the back and menu keys. By default, the back button is to the left and the menu key is on the right, but that is a setting that you can flip if you prefer it the other way around. The ZTE Blade S6 Plus comes with a 5.5-inch IPS LCD display, with a 720p resolution, resulting in a pixel density of 267 ppi. Considering the size of the display, this resolution may be a little low for some, but my experience with the display was very good, with everything including videos and games, looking great. The display brings with it all the loved features of IPS LCD panels, including vibrant but not overly saturated colors, great brightness, and good viewing angles. If I had to complain about something I would have to mention that the brightness level set by the phone, when using auto brightness, was just a little to high for me. I found myself adjusting the brightness manually to compensate. Under the hood, the Blade S6 Plus packs an octa-core 64-bit Qualcomm Snapdragon 615 processor, clocked at 1.5 GHz, and backed by the Adreno 405 GPU and 2 GB of RAM. This is one of the best mid-range processing packages currently available, that allows for a performance that is quite similar to its more high-end counterparts for every day tasks. The Blade S6 Plus is snappy, responsive and fast. Animations run smoothly every time, apps opening quickly, and multi-tasking is a breeze. The gaming experience is also great, with the device handling graphic-intensive games very well. The device comes with 16 GB of on-board storage, which is further expandable by an additional 32 GB via microSD. However the storage comes partitioned. The 16GB is divided up into a system area, of 4.29GB; a user area of 3.87GB, which is used for installing apps; and phone storage of 7.83GB, which is used for data and media. There is an option to move apps from the user area to the phone storage. Unfortunately there is no option to move apps from either the user storage or the phone storage to the SD card. You are able to set the default write location to the external SD card, however this seems to be a bit hit-and-miss in terms of which apps respect or understand this setting. Also, the camera app has a separate setting for where the images are stored, and it can be set to use the external SD card. A single speaker is found on the back at the bottom right corner, and while it does get the job done, it obviously doesn’t provide as good an experience as you would get with a front-facing speaker. I managed to get up to 36 hours off the charger, with around 3.5 hours of screen-on time. A standard suite of sensors and connectivity options are available, including support for 4G LTE, but it is worth noting that since this device is catered towards the Asian and European markets, it doesn’t connect to LTE networks in the US. The ZTE Blade S6 Plus is a dual SIM device and supports 3G on 900/2100MHz, and 4G-LTE FDD on 800/900/1800/2100/2600MHz. Each 4G provider around the world uses one of the pre-defined frequency bands. My carrier uses 1800MHz (band 3), so the S6 Plus worked on 4G without any problems. Before buying the phone you should check with your carrier to ensure compatibility, or if you trust Wikipedia, then it has a global list of LTE networks. This device is compatible with two 3G frequencies: 900/2100MHz. Like the 4G coverage, compatibility depends on your carrier. The supported bands should give you 3G access on most carriers in Europe, the Middle East, and large parts of Asia. Unfortunaly the 3G won’t work in North America. You should always check with your carrier to ensure compatibility, or look at Wikipedia’s List of UMTS networks page. When it comes to the battery, the Blade S6 Plus comes with a 3,000 mAh unit. In my testing, I managed to get up to 36 hours off the charger, with around 3.5 hours of screen-on time. A battery saver mode is also available, so you will have the option to squeeze some extra juice out of the battery in an pinch. I didn’t some individual app testing and according to GameBench Epic Citadel will run for around 3 hours on one charge, while YouTube will stream videos over Wi-Fi for 6 hours, again on one charge. The camera on the smaller Blade S6 is quite impressive and the Blade S6 Plus uses the same tech. What you’re looking at is a Sony made 28 mm wide-angle lens, coming in at 13 MP. If you’re a selfie lover, you’ll enjoy the front-facing camera. When you jump into the camera interface, you’re going to notice two modes – simple and expert. Simple is basically just an auto mode that lets you snap photos without having to worry or play around with any additional camera settings. On the other hand, Expert mode introduces a few additional controls like white balance, ISO, metering, and exposure, but that’s about as extensive as it gets. Various shooting modes like HDR, panorama, and a few others are also available, but one thing to note is they’re only accessible when you’re shooting in the Simple mode. Pictures are sharp and vibrant in color, but not overly so that it looks unrealistic, and in most situations where lighting was adequate, I was able to get pretty much any shot that I wanted. The f/2.0 aperture is also great, and you can create pictures with a shallow-depth of field quite easily, something that you can normally only achieve with a DSLR camera. When outdoors the camera does a good job of bringing out more details, while with indoor shots you can get good photos, especially if the lighting is strong. The HDR post-processing also helps with the indoor shots, that is maybe something you wouldn’t expect, but it certainly does help add a vibrancy to what could otherwise be dull images. In low light, performance can be a bit hit-and-miss with high noise levels. But with a steady hand you can get reasonable results, however don’t expect too much as the camera has a maximum ISO of 800. Overall the rear camera is pretty solid, and it is certainly one of the plus points of the phone. If you’re a selfie lover, you’ll enjoy the front-facing camera, as it comes in at 5 MP. The quality isn’t spectacular by any means, but just like the rear camera, it is a wide-angle lens, which means that you can easily fit you and a couple of your friends into a single shot. With Android 5.0 Lollipop out of the box, the ZTE Blade S6 Plus is one of the growing number of phones that now run the latest iteration of Google’s mobile OS. You get all of the great features of Lollipop with a few additions from ZTE, including its custom launcher. While the custom launcher does have its unique features, a lot of the stock elements of Android 5.0 are available here. Elements like the lockscreen, notification shade, overview, and applications like the settings, dialer, and clock still preserve the material design from Google. Like the software experience we get on many devices from Chinese OEMs, the custom launcher is colorful with squared icons, and does away with the standard app drawer in favor of having all applications reside on the home screen, leaving you dependent on folders to keep things from getting too cluttered. Of course, this is still Android, so you always have the option to download a third-party launcher from the Google Play Store if you are looking for a more familiar experience. Tapping the menu button, or swiping up from the bottom of the screen, brings up the launcher customization panel. Here you can choose from a series of solid colored or abstract wallpapers, or download one from ZTE’s online library. There is also a built-in slider to give your wallpapers a blurred look, plus you can also alter the desktop transition effects. Once you’re satisfied with all of the changes that you’ve made, you can create a backup within the launcher preferences so you never lose them. ZTE has also included the option of a navigation helper called MI-POP. It is an on-screen bubble with navigation keys, to help with one-handed operation. Since the screen on the Blade S6 Plus is quite large this could be a very handy feature. It is also worth mentioning the built-in infra-red remote control. The bundled app lets you use the IR blaster to control a wide range of electronic and household appliances including televisions, set-top boxes, and air conditioning units. So there you have it – the ZTE Blade S6 Plus! What you get is a large screen device that offers a best-in-class processing package, a solid camera experience, and the latest iteration of Android, all in a very affordable package.